New Delhi: History may not be the subject many like to explore. But 18-year-old Arsh Ali loves to dig deep into it. He is India’s youngest archaeologist, despite not yet having acquired a formal degree in archaeology. 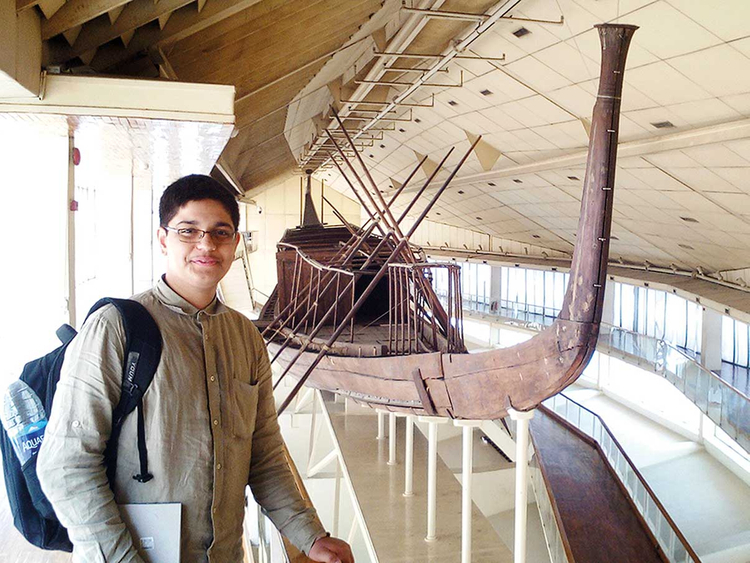 For the past few years, the Allahabad-born teen has been spending most of his time researching ancient history, visiting digs, attending seminars and delivering lectures in ancient and modern history and archaeology to postgraduate students at several universities in the country. Thereafter, Ali became part of archaeological excavations and explorations in several places such as Purana Qila in New Delhi, Barnawa and Sinauli in Uttar Pradesh and Sanchi in Madhya Pradesh. His adventures with art and archaeology began at the age of four, when Ali made sketches of monuments and temples he visited. Amazed at their child’s talent, his parents, Fatima and Faisal Ali, decided to hold a solo exhibition of their son’s illustrations that were sketched without once using an eraser. When he was six, the family visited the Pashupatinath Temple in Kathmandu Nepal. As they sat at a restaurant, Ali sketched the temple, including domes and flags, on a paper napkin in one go. Later, as a student of Grade 8, when Ali visited Bara Imambara monument in Lucknow, Uttar Pradesh, accompanied by his parents, the site conservator was aghast with his knowledge, which sprang from inscriptions to history, and from sciences to methodologies in archaeology. Along with this, Ali is working to establish the evidence of the existence of Buddhism in Egypt. He is tracing the route of the Buddhist emissaries of the Mauryan emperor Ashoka in Ptolemaic Egypt. The Egyptian tombstone revealed an engraving of Dharma-chakra, an important Buddhist symbol, dating to the time of the Ptolemies in the 3rd century BC. In connection with this, the young archaeologist also visited Sanchi, one of the most important Buddhist sites in India’s Madhya Pradesh state. Few months ago, Ali delivered a lecture on the subject at the National Museum in Delhi. His research paper on the topic will be published soon in Purattatva, one of India’s prestigious archaeological journals. His study into natural sciences continues to impact his approach and perspective towards his work. Currently, he is translating the Vedas into hieroglyphs, the ancient Egyptian writing system, which will be the first work of its kind. Never has an ancient text been translated from one ancient language into another, though one sees a lot of translations into modern languages. Asked how he learnt hieroglyphs, Ali coolly described, “I started studying these symbols, which are in lakhs, and the grammar that goes with it, when I was barely 7-8 years of age.” In fact, he has mastered writing and reading hieroglyphs and is perhaps the only Indian to do so. Only 200 people across the world hold a degree in the subject. Incidentally, Ali knows more than 15 languages, including Arabic, Ugaritic, Hebrew, Brahmi, Greek, Nabataean, Phoenician and Kharosthi. “It is all due to my interest in books on history, mythology and languages. There is so much to learn and discover,” he states. Arsh Ali was born on August 18, 2000, in Allahabad, Uttar Pradesh. After his early education from Allahabad, he studied till Grade 10 in City Montessori School, Lucknow, Uttar Pradesh — 2012-17. He was allowed access to antiquities at the national museums in Cairo and Alexandria in Egypt.